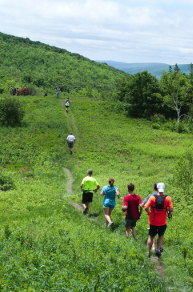 New races this year - Powisset Farm, Wolf Den Dash, CDC Half Marathon, Trails to a Cure, and Peaked Mt adds a 4 hour race. Some races are substantially less expensive with early pre-registration - plan ahead if you can. Ben's Trail Running Western Massachusetts is available in bookstores and online. Spring is here, and fun runs start at 5:30pm from the parking area next to Hoosac Valley High School on Route 116 next to the Adams / Cheshire town line. Runners of all abilities are welcome. if you have questions, suggestions, or inexplicable desire to immerse yourself in post-Y2K web design. The snowshoe series has moved to Dion WMAC Snowshoe Series website (thanks Jamie!!). Ten years of the best of trail running - results, stories, photos, book reviews, lore, and laughs: Trail Running News.